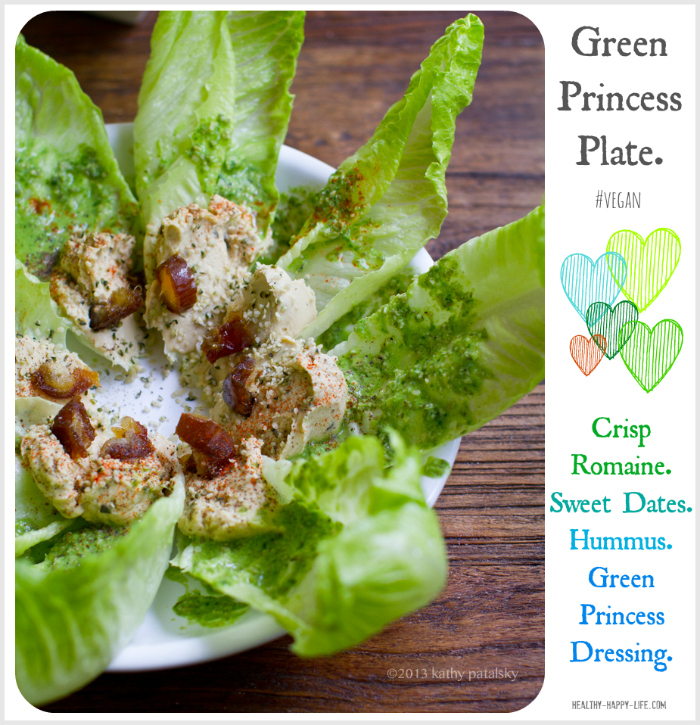 Green Princess Plate. 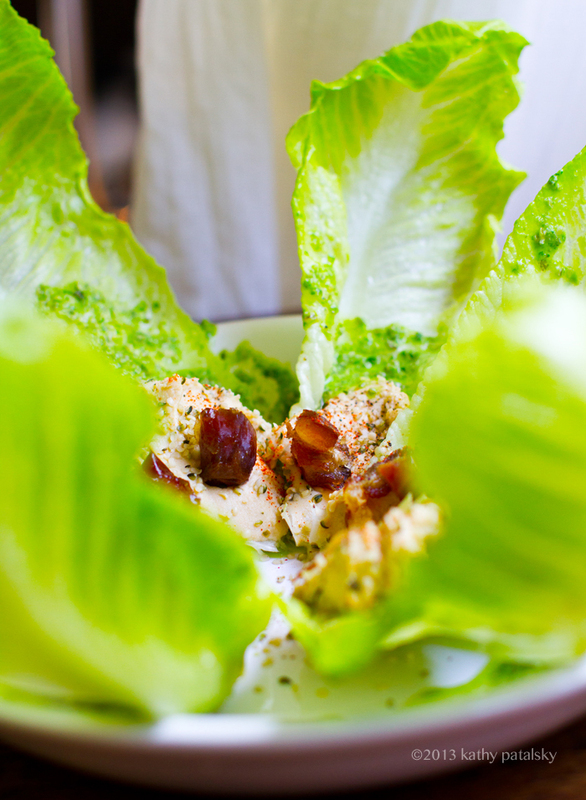 Romaine Salad + Fresh Green Dressing. 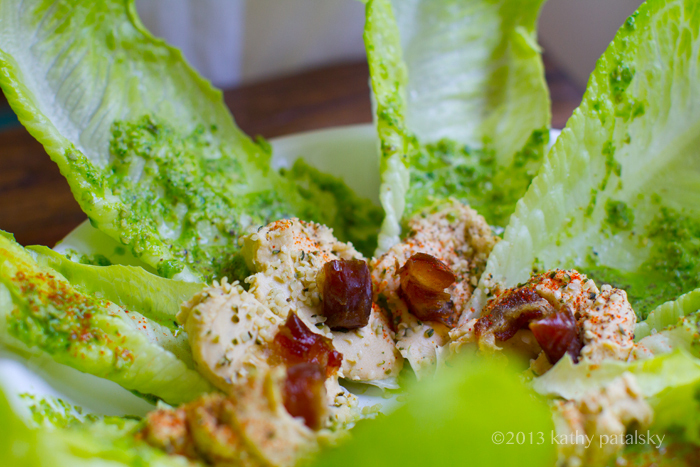 So I had this romaine. 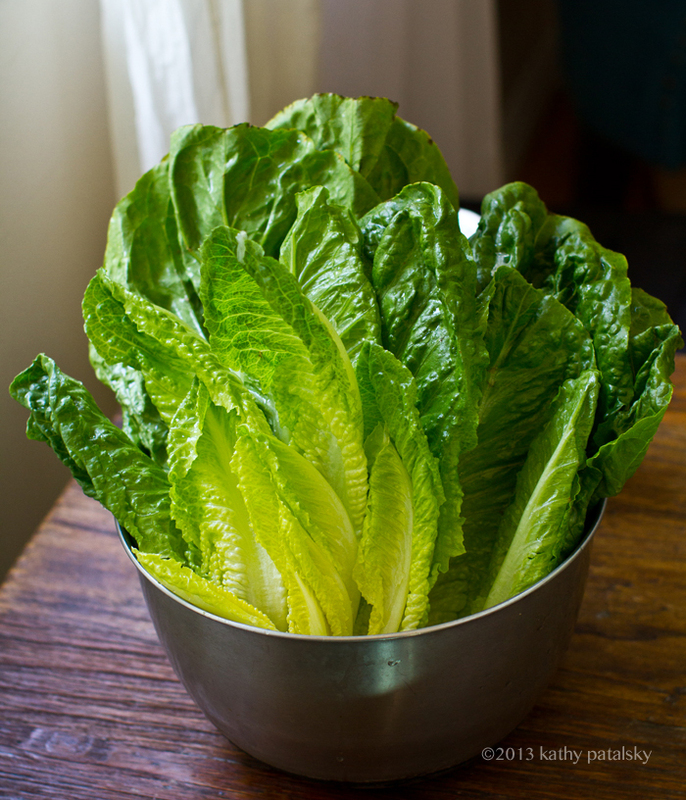 Romaine lettuce that I picked up at the organic Farmer's Market, the market held every Saturday in Santa Monica. 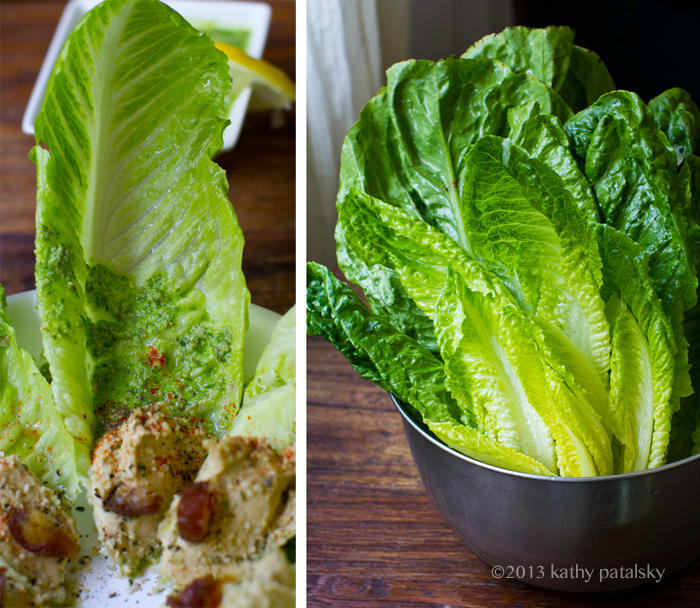 Oh my this romaine. I spotted it perched on a table, piled on top of ten or fifteen other glossy green lovelies just like it. Gorgeous, fluffy, sprawling leaves of spring green so crisp and fresh that you could easily munch them down leaf by leaf. No dressing required. So for this recipe I didn't want to do to much to these leaves. I couldn't even bare to chop them up! 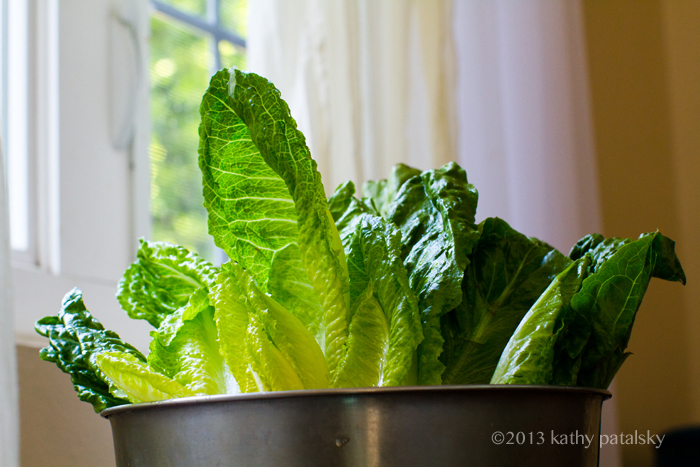 It all starts with a fluffy head of organic lettuce..
No Dates? You can use any sweet accent. Try organic raisins, chopped apricots or your favorite fresh fruit like blueberries, banana, apples or pears. 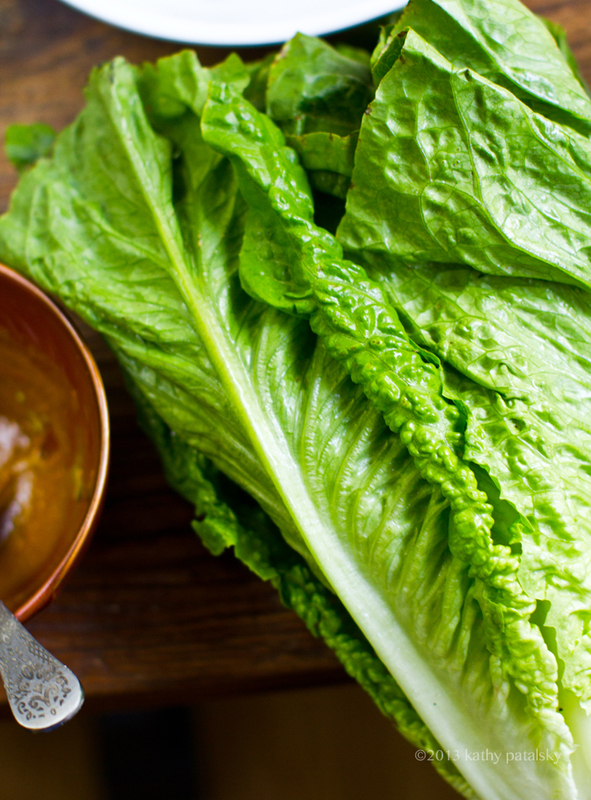 -> Romaine might be better for you than you think. 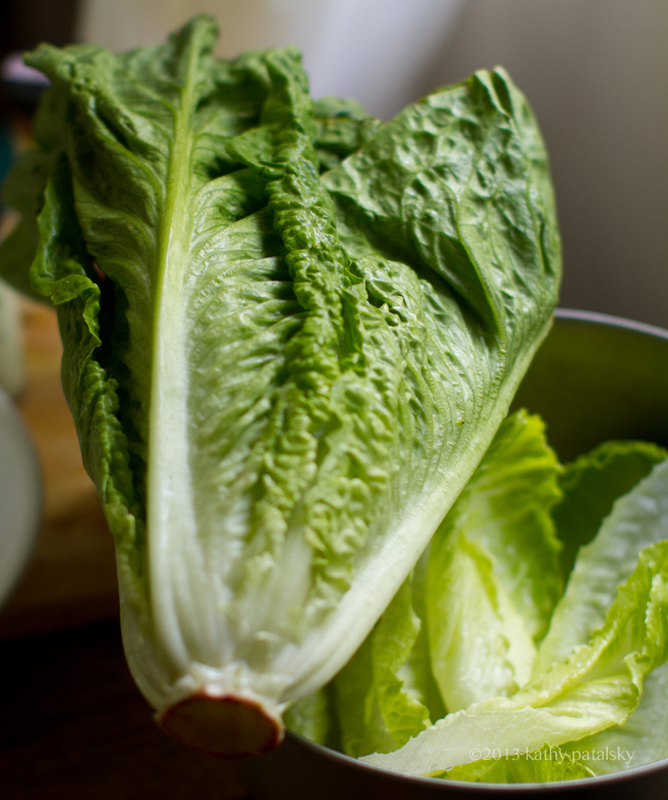 Compared to the dreaded "iceberg" lettuce..
* Romaine lettuce is rich in vitamins A, C, K and folate. It is a good source of iron, potassium and manganese. 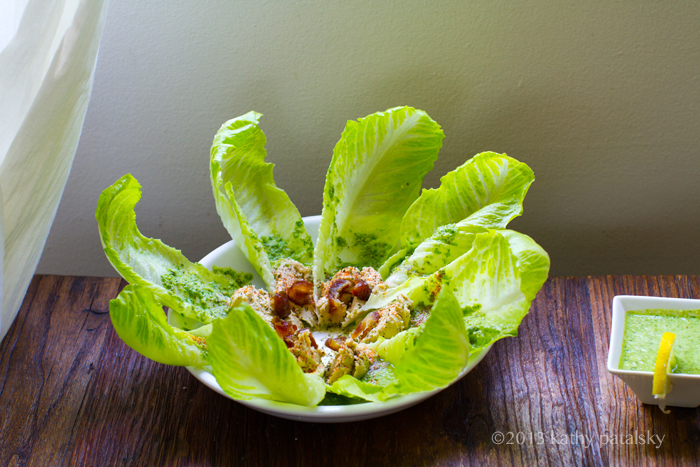 * Iceberg lettuce has a nice dose of Vitamin K and Manganese … but that’s about it. More stats (per 100 grams)..
RDA’s based on 2000 calorie diet.. 147% Vitamin A, 128% Vitamin K, 34% Folate, 40% Vitamin C, 5% Iron, 3% Calcium, 7% Potassium, 8% Manganese. RDA’s based on 2000 calorie diet.. 10% Vitamin A, 30% Vitamin K, 7% Folate, 5% Vitamin C, 2% Iron, 2% Calcium, 4% Potassium, 6% Manganese. 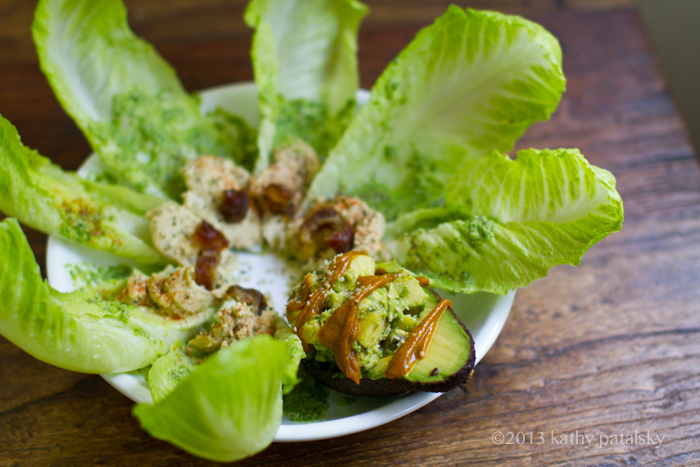 Creamy version dressing -> add 1 small avocado or 1/2 large avocado to blender! 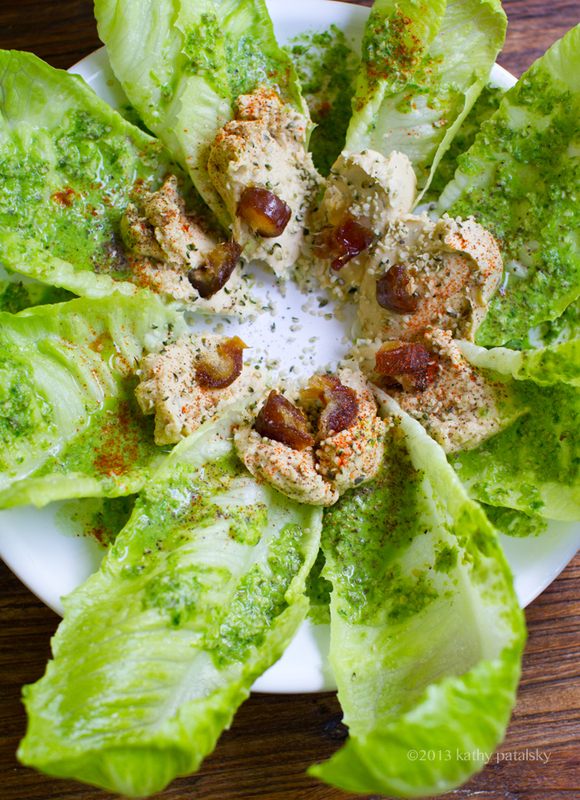 This spin on "green goddess" dressing includes creamy homemade hummus, sweet dates and loads of green goodness from fresh romaine lettuce spears and a dreamy green dressing. 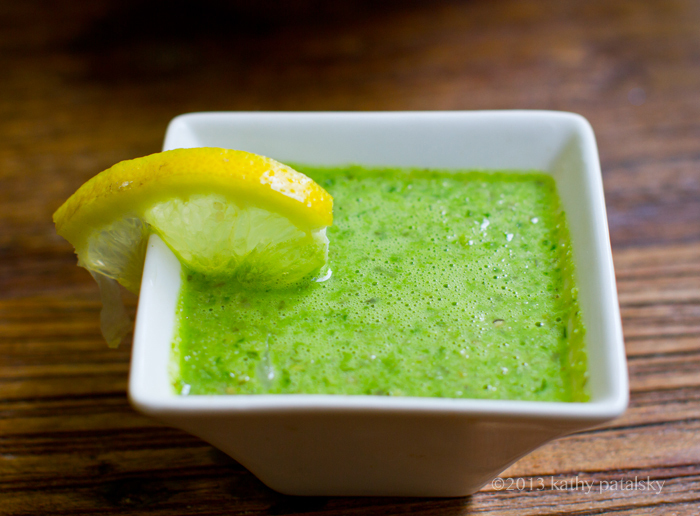 Add all dressing ingredients to a blender or food processor. Blend on low until thin and textured. 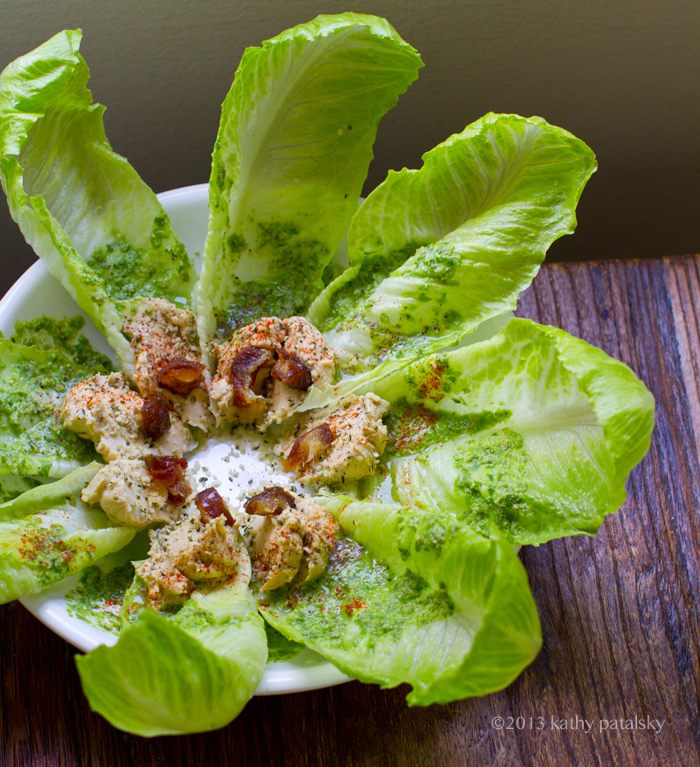 Slightly creamy, but more of a dressing texture than a 'pesto'. If making your own hummus, it is best to have it premade and chilled in the fridge for a few hours so it dollops well on the spears. Remove pit of date, chop into bits. 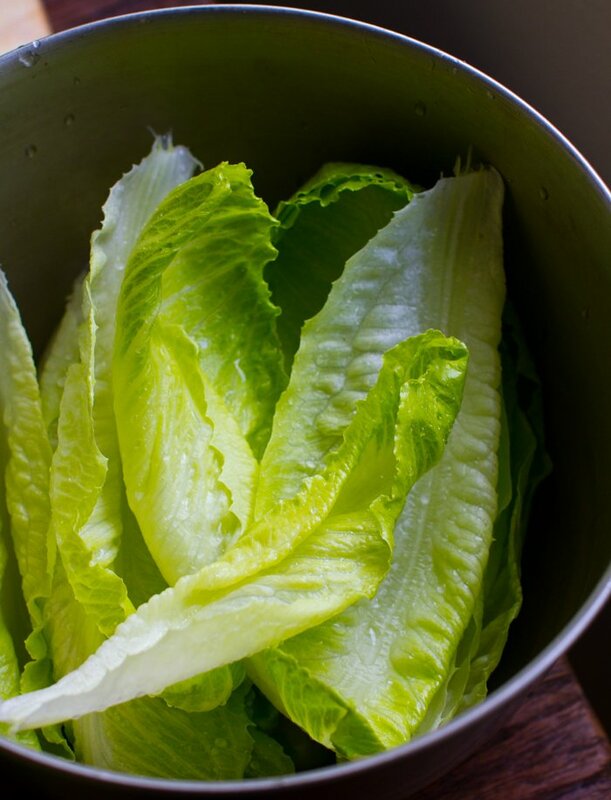 Rinse romaine leaves in ice cold water to freshen. Easy set-up. 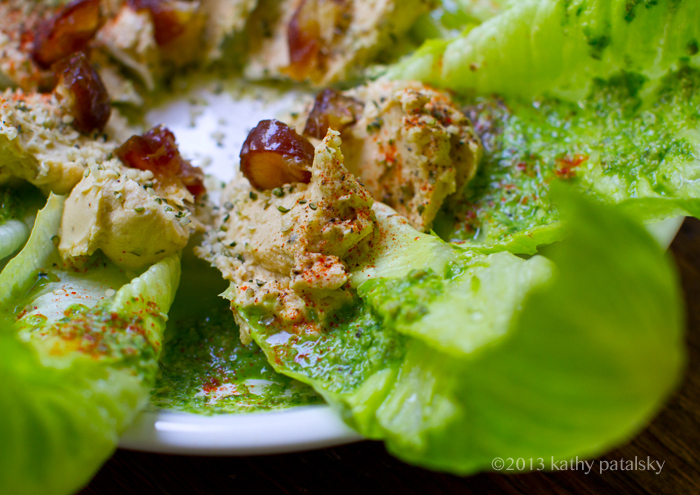 Add hummus to ends of leaves and place in serving dish. Add date bit, dash with pepper and cayenne. 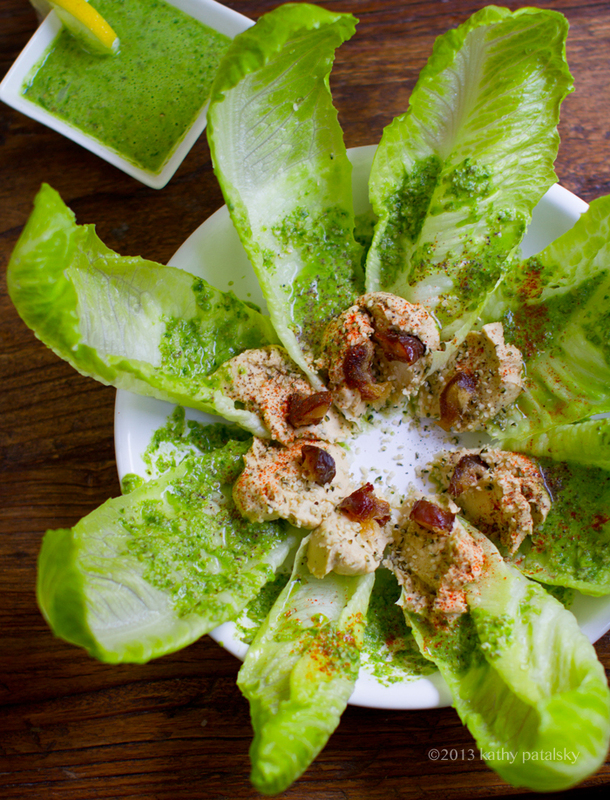 Fill serving plate in a flower-design with hummus-topped spears. 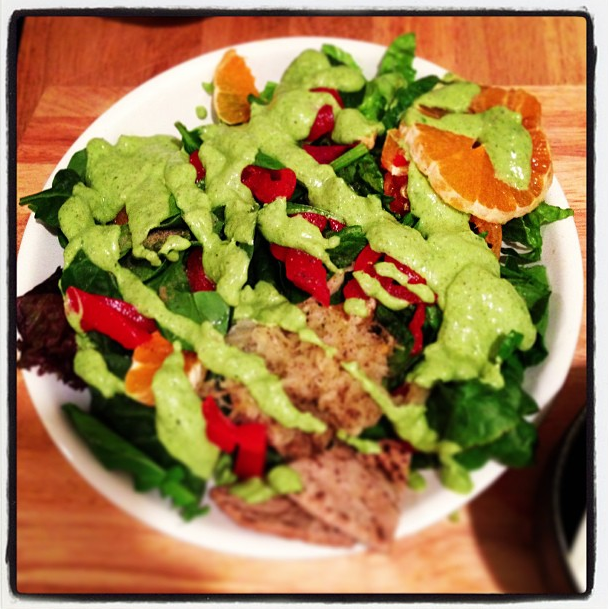 Drizzle a generous amount of dressing over top and feel free to dip the spears in leftover dressing as you eat. Enjoy!